In 1762, the Episcopal Brethren of Hartford paid 80 pounds for land on the west side of Main Street, north of what is now Church Street. Their intent was to build what would be the first Episcopal church in the Connecticut Colony. The Congregational Church was the established state-supported church in the colony and for many years other denominations were actively discouraged. 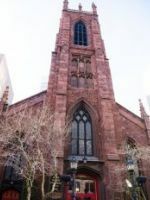 After a stone foundation was laid, a lack of funds and the outbreak the American Revolution frustrated the efforts of the Episcopalians until 1792 when the frame of the first Christ Church was raised. Completed in 1795, the church was built in a typical style of the day—a white clapboard meetinghouse. During the Revolutionary War, Episcopalians often were looked upon as traitors because of their affiliation with the Church of England. Property of the Hartford group was confiscated and not recovered until 1784, the same year that Samuel Seabury, a native of Groton, Connecticut, was consecrated in Aberdeen, Scotland, as the first Bishop of Connecticut. The Diocese of Connecticut was the first Diocese of the Episcopal Church in the United States. The growing congregation in Hartford needed a larger church and in 1827 Christ Church engaged Ithiel Towne of New Haven as architect. The congregation purchased land on the southern corner of Main and Church Streets. The foundation was laid in May1828 and the building was consecrated on December 23, 1829. 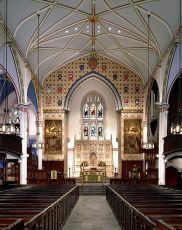 Christ Church became one of the first Gothic-style churches in the United States. It is modeled after York Minster in England and is listed on the National Register of Historic Places. In 1912, the Rt. Rev. Chauncey Bruce Brewster, fifth Bishop of Connecticut, proposed designating a large urban parish to serve as a cathedral for the Diocese. His idea was accepted as was his choice of parish—Hartford’s Christ Church. 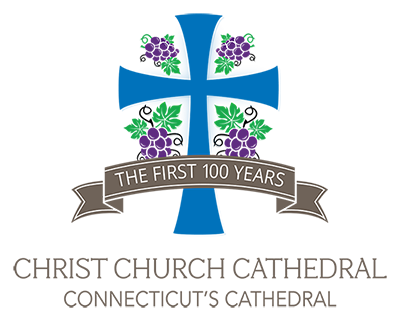 By 1919, all the plans were completed and on Easter Monday of that year, Christ Church was renamed Christ Church Cathedral. View of the chancel from the center aisle - When it was built, Christ Church measured 100 feet long by 70 feet wide. In 1879 the chancel was recessed, adding 16 feet to the length. This addition is marked by the molded arch. Ohio stone was set in place in rough block, and the moldings cut after it was in position. The roof inside the arch is oak, made in the form of a barrel vault with molded ribs and elaborately carved bosses where the ribs intersect. At its highest point, the ceiling rises 46 feet above the floor of the church. It consists of six trusses put together without mortise or tenon. This is an early example of what later became Ithiel Towne’s patented design for bridges. View of the chancel from the balcony - The present organ, dedicated in 1965, is located on the right side of the chancel. The original Christ Church owned the first organ in Hartford and in this part of Connecticut. Until the 20th century the organ was situated in the rear gallery. The brass eagle lectern, symbolic of St. John carrying the Word throughout the world, was made by John Harman & Co. of Birmingham, England. It was added to the church in 1879. 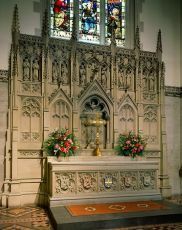 The High Altar - The heavily carved altar was inspired by a tomb in Canterbury Cathedral. The front panels are carved with the symbols of the four writers of the Gospel. The center panel features Christ’s cross surrounded by fleur-de-lis. The 27- foot- high Chancel window depicts the Transfiguration. Given in memory of the Rev. Dr. Wheaton, it depicts Christ in the center light above the transom. On the right is Moses with the stone tablets and on the left, Elias holds a book. Peter, James and John fill the lower lights. Chapel of the Nativity - Replacing the chapel built in 1879 (now the choir room), the Chapel of the Nativity dates from 1907. The walls are painted blue and stenciled with fleur-de-lis, the symbol of the Virgin Mary. Overhead, the dark blue ceiling is painted with stars, a reminder of the sky over Bethlehem at the first Christmas. The floor is red Mercer tile. 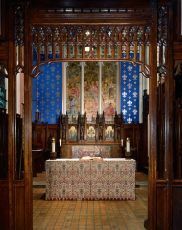 There is a carved wood screen behind the altar; three painted panels that depict the Annunciation, the Crucifixion and the Nativity and a painted tile mosaic portraying Dorcas giving clothing to the poor (Acts 9:36-42). 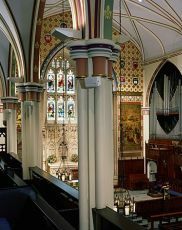 The Antiphonal Organ - The antiphonal device built in 2001 by the Austin Organ Company completed the original1965 plan. The rear gallery organ is enclosed in a handsome case of red oak, and provides support for congregational singing. 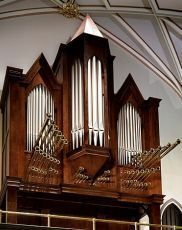 The Trompette-en-Chamade stop, horizontal pipes made of brass, is the crowning glory of the rear organ as well as a triumphant sound over all the organ. With the addition of the antiphonal division, the Cathedral's organ has sixty stops and seventy-one ranks of pipes. 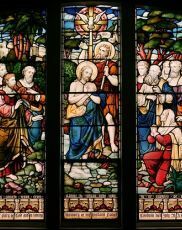 Stained Glass Windows - The style of the eight stained glass windows is copied from the Church of St. Mary the Virgin, Oxford. Each window is divided into three bays by mullions rising to intersect the arch. Each is twenty-five- feet high with a transom dividing the upper and lower compartments. Most of them were made by the London firm of Heaton, Butler & Bayne. 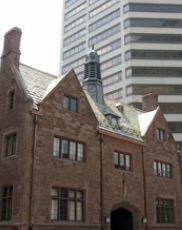 The Cathedral House Built in 1916, is where the Cathedral's main offices are located as well as an auditorium and meeting rooms. Our Church Street Eats Program and the Hands On Hartford Manna Program serve more than 40,000 meals annually from this location to Hartford's indigent population.